We are the ORIGINAL KardKase. Check our 100% customer feedback! Keeping your collection safe doesn't mean having to use old shoe boxes. No, now you get professional storage options for professional collectors. 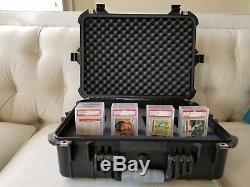 This waterproof graded card storage box is going to be a dependable option that is going to last you years of collecting. With enough space to fit 170+ cards, you'll be able to put this to use as your collection grows over time. As mentioned, this is waterproof and perfect for giving you that peace of mind if you need to transport your cards but don't want them at risk in the elements. Perfect for storage and transport, this is also going to be great for a display case when you travel to card shows and you want others to admire your collection. Your case will come with customizable foam inside to craft your display and storage components designed to fit what works best for you. What this all comes down to is remembering that you need the best equipment to take the best care of your cards. This is what is going to provide you with that and then some. 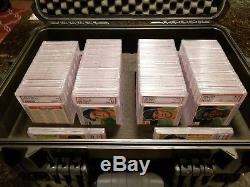 Holds approximately 170 graded cards. Equipped with an O-ring seal and pressure-equalization valve. Two pad lockable clasps and powerful stainless-steel hinges. Description Composed of a high-impact material and resistant to extreme hot and cold temperatures ranging from -30°C to 90°C, this high-intensity, airtight, lightweight, and durable protective box will protect your important documents and valuables in nearly any adverse environment. The protective box features die-cut foam inside and a customizable compartment to store all of your valuable goods snugly and safely. This safety box also includes a pressure valve that maintains internal and external pressures and the O-ring allows you to manually adjust the internal pressure. Once you draw the latch snaps tightly closed, it resists being broken even under higher impact. Outside dimensions: 19.78" x 15.77" x 7.41. Inside dimensions: 18.06" x 12.89" x 6. Shock-proof design prevents contents from being broken or damaged if dropped. Pressure-proof design prevents contents from being broken under pressure. Moisture-proof design prevents the contents from rusting if box is submerged. Features a valve that maintains the balance between internal and external air pressure It has testing standards that reach IP55. Inside foam is composed of pick and pluck cubes. It can be cut horizontally and vertically in order to create small cubes that can be plucked out. Surrounding foam can be customized to the shape of what you are storing in the case. The handle in the front allows for the box to be easily transported. Measure the cards you would like to customize the case for and count the number of cubes you should remove to fit your specific card set. We find that a serrated knife works well to cut the cubes from their spaces. The item "CERTIFIED Waterproof Cards Graded Storage Box Display Case Pelican PSA BVS BGS" is in sale since Wednesday, February 8, 2017. This item is in the category "Sports Mem, Cards & Fan Shop\Sports Trading Cards\Storage & Display Supplies\Card Storage Boxes". 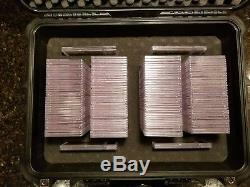 The seller is "kardkases" and is located in Hickory, North Carolina. This item can be shipped to United States.